Dear Current Occupant mixes poetry and prose to tell a story about home and belonging, set in the 1980s and 1990s of Vancouver's Downtown Eastside. Chelene Knight is a Vancouver-based writer and editor. 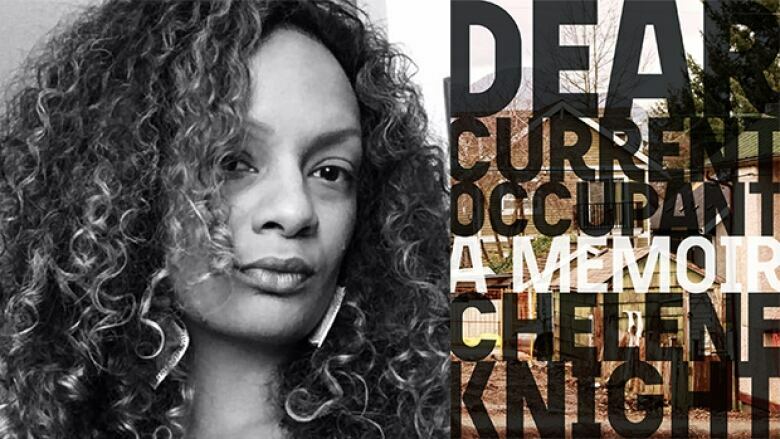 Of Black and East Indian heritage, Knight's Dear Current Occupant mixes poetry and prose to tell a story about home and belonging, set in the 1980s and 1990s of Vancouver's Downtown Eastside. The book plays with genre by way of a series of letters addressed to the current occupants now living in the 20 different houses she moved in and out of with her mother and brother. Knight tells CBC Books how she wrote Dear Current Occupant. "The first draft was originally all poetry, but my publisher suggested I rewrite it as creative nonfiction. I tried to write this book in generic memoir form. I sat down wanting to write about some of my childhood experiences. But it couldn't come out. I thought maybe it's not the right time. "Then I was on the bus one snowy day and I passed by one of the houses that I lived in as a child and something sparked in me. I got off the bus and I stood in front of this house. I had a notebook with me and I started scribbling. The memories were coming back to me — flooding in — and it was this visceral thing where I needed to be in that place and then be transported back to those times." "I decided to walk the neighbourhood to see which house stood out for me. I didn't know the address for some of them but I knew if I walked by I'd be able to spot it. I needed to be alone, in the space by myself. I went up to some of the houses and touched the walls and the doors. I didn't ring any doorbells. I must have looked crazy, walking around with a notepad. But it was the only way I could do it." "There's an honesty in doing it this way. I think about my memories and the trauma. I wanted to stay true to how I remember things. A lot of it was fragmented and it wasn't chronological. I'm writing these small vignettes in the way that I would have seen them when I was a little girl. "As I was writing, sometimes the words would shift and get a little more sophisticated. I realized maybe it was older me speaking, so I just ran with that. Writing this was not necessarily therapeutic. I'd already healed from a lot of this and already made peace with a lot. I want folks to see that you can go through some tough things but be capable of big things afterwards. This is a survival story, and an empowering one at that." Chelene Knight's comments have been edited and condensed.